Recently my wife and I traveled to Italy for 10 days. In preparation I did a lot of research on international cellular plans and costs. I am an AT&T customer and to put this at a point in time, most of my research took place in September 2011. Plan A was to acquire a local SIM card in Italy and use that for wireless voice and data. I didn't really foresee a lot of voice requirements but data is always nice for e-mail and, while on foot in a foreign city, GPS/mapping data. While this is mechanically simple (just pop in a SIM from an in-country provider) it turned out to be harder than that. First all the in-country provider web sites are in the local language, in this case Italian. Google's translation capability left a lot to be desired in the subtleties of cellular terms and conditions. Second AT&T could not get my Captivate unlocked (required for a non-AT&T SIM). They even referred me to Samsung who couldn't accomplish this either. You should be careful when attempting this in that there is a limit on the number of unsuccessful unlock attempts (reportedly less than 10) allowed before the phone can never be unlocked. AT&T recognized this and said they would replace the phone (with another locked) phone if they reached this point. Anyway, we all gave up before the phone was permanently locked. At that point I escalated to a manager at AT&T and they offered a reasonable alternative. They applied a $100 credit to my account to cover the cost of AT&T international coverage while I was in Italy. That seemed more than fair and I accepted their offer. In the meantime, a friend of mine had a Vodafone SIM and I had the unlock code so ... I put the Vodafone SIM in my Captivate and turned it on. It asked for the unlock code and I entered the code that AT&T had given me. Bingo! That worked. But back to Plan B. 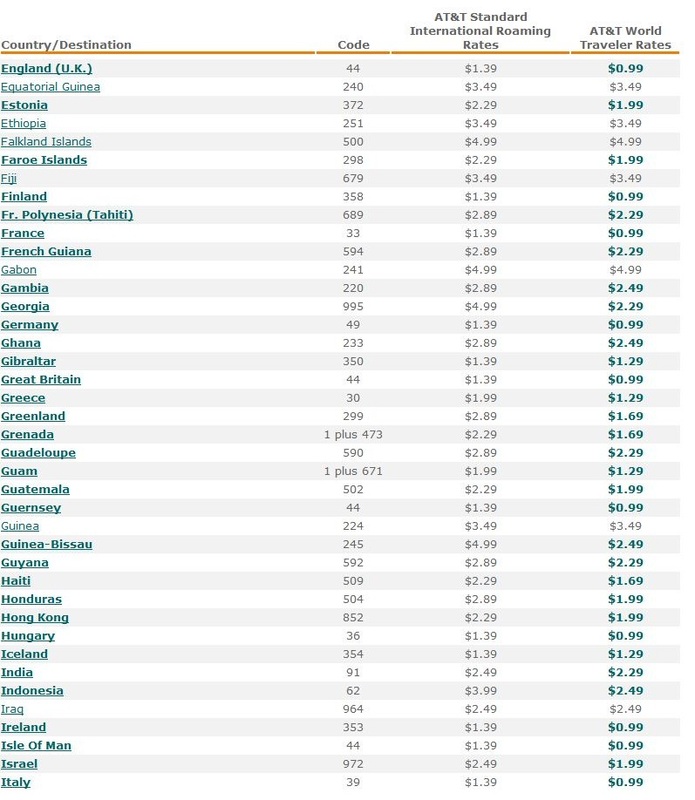 Here's what I found when I researched the international rates in Italy for AT&T. This link will get you to all of the plans above. 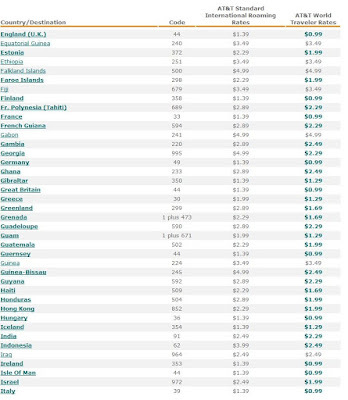 And this link will get you voice rates per minute by country by plan. Just in case I've include screen shots of what was there when I was looking. Each of these features can be pro-rated for a partial month but the way that they are applied varies, e.g. Global Messaging kicks in on the first day of your billing month and International Data turns on and off day by day. Anyway I went with these 3 features and got the 125MB International Data plan. This would have been a total of around $66 plus $.99 per minute for voice if I let them run for a full month. How'd it turn out? I used just a few minutes of voice so I probably would have been better to go without the $5.99 uplift and have paid the extra $.40 per minute but it would have been close. Same with texting. I'm not a big texter so I used less than the break-even 20 texts. Again, it would have been close and having a 50 text allowance made me not worry. Both hotels we stayed in had free Wi-Fi (more in a little) so I used Wi-Fi when we were in the hotels. Since the International Data plan is pro-rated I called AT&T a couple of days after we returned to get my international data usage. The representative didn't have this readily but called back in a couple of hours with the data. With the Wi-Fi in the hotels I only used about 35MB of cellular data so I canceled the International Data plan and the charges and data allowance were pro-rated. Overall, my AT&T charges were less than $66 even including the per minute voice charges. This $66 was against the $100 credit from AT&T so I was good. Using AT&T's international offerings was a good deal for me (frankly even without the credit) and not having to fool with unlocking and a non-AT&T SIM. Now, for the rest of the story. While both hotels I stayed in had free Wi-Fi each was problematic in its own way. The first iQ Hotel Roma has wireless but you had to have an ID and password issued by the front desk. This required a login page be executed by the browser. I don't know about you but I often have trouble getting these pages up on my various Android devices. And each ID/password combination was limited to a single MAC address at a time. For example, if I was using Wi-Fi on my phone, my wife couldn't use the Nook to access her e-mail. The front desk would issue you more than one ID/password combination so it wasn't the end of the world. The Wi-Fi worked really well throughout the building including the roof garden. The second hotel Arpaiu advertised Wi-Fi in all rooms but that wasn't so. It only worked upstairs in the common area. For a 1,000 year old building in the middle of nowhere that actually was pretty good. But it did mean that you had to get dressed and climb up 2 flights to check your e-mail. Looking back I think that next time I'll try to get a local SIM card with a data plan. Not so much because it would be cheaper but because I could use that 3G data instead of the hotels' Wi-Fi. I'd need to enable access point mode on my phone to make that apples to apples. Figuring out how to do that over the web in a foreign language wouldn't be easy so I'd need to dedicate some time when I arrive to get all that working. If your travel involves more than one country stick with the AT&T plans. Note that there are a couple of things that you need to do with your phone. Turn off background data. On my Captivate I go to "Settings," "Accounts and Sync" and uncheck "Background data." This means that you'll have to initiate a refresh with each application. Next turn on data roaming. On my Captivate I go to "Settings," "Mobile Networks" and check "Data roaming." This will let you roam for data onto the foreign networks. Make these changes in this sequence on your phone when you arrive at the foreign destination. On departure do these in reverse at the foreign airport. Send me pictures from your trip!